Bumped by a Quake – Have a Better Story? Case Studiesearthquake2 Comments on Bumped by a Quake – Have a Better Story? There are good days in PR and there are bad days in PR. There also days so unexpected and out of the ordinary, that you just have to throw your hands up, sit back and chuckle. Over the past three weeks, Excelsior College’s communications team, including yours truly, had collaborated with Sage College on a joint press conference to announce the first ever bachelor’s degree for individuals on the autistic spectrum. Unique story angle 1. While Sage spearheaded many of the logistics around the press conference itself, we here at Excelsior spent a good amount of time with message development and corralling print media. This was, after all, an opportunity for our President to announce the reason for the collaboration itself – a new, one-of-a-kind division which will focus on building online programs for brick-and-mortar institutions under a profit-sharing agreement. Unique story angle 2. Albany Mayor Jerry Jennings and State Senator Roy McDonald, both strong advocates for education and the underserved, jumped at the opportunity to attend and speak some very heartfelt words on the need to reach out to those communities often left behind. Unique story angle 3. Combine each of those three unique story angles, and it’s no surprise, that the who’s who of local print and broadcast media showed up. The conference went off without a hitch. All seemed right in PR land as I lay back in my chair to open up a can of peanuts early yesterday afternoon. And then I started shaking, only coming to the realization that I wasn’t suffering from some acute medical condition when a co-worker blurted out, Is this an earthquake? Yep, just like that, my office was in a tizzy, convening at the water cooler to swap stories or calling loved ones down south. Me? I just shook my head. 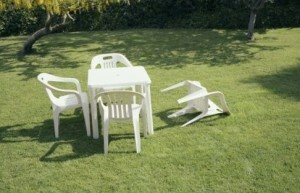 I knew, after all that work, we were getting bumped by an earthquake. In Albany, N.Y.
Of course, everyone has their strange, unbelievable story about that one time when PR perfection came crashing down unexpectedly due to events far beyond your control. You know, the remember when moment you can only share with a fellow PR person over a beer – because they are the only ones who would truly understand. So, here’s your time to share. What you got? Tell us your story about being bumped for a natural disaster, buried by a dancing koala bear, or when your client press tour stop was usurped by a sleazy governor getting caught with more than a few high-priced prostitutes. What did you do? How did you react? The floor is open to you. *Update: It seems the floor is closed to you. We are experiencing a problem with our comment section and are looking to remedy the situation. **Update 2: Comments are good to go! When I was at RIT (I’m now at SUNY’s The College at Brockport), we spent weeks planning an elaborate news conference to unveil our new innovation festival. An innovation festival requires an innovative press event, right? We pulled out all the stops–including having our President ride in on a Segway and an exec from our top sponsor ride in on an electric bike. We were poised to have some great media coverage. And then Eliot Spitzer resigned. So much for that. All the Rochester media came out, but coverage was minimal. Further proof that it’s better to be lucky than good. I worked in the Assembly communications office for four years, including during the Spitzer train wreck. I still remember the story breaking on Drudge Report and the office ordering a couple pizzas and going to watch the news because we knew there was no way any other story was making the news that day. We might as well enjoy some good food.